This summer was a special time; my son was heading off to college, so we were determined to spend as much quality time together as possible together. We scheduled our vacation well in advance and arranged a 3-day, 20 mile hike through Rocky Mountain National Park. In choosing the location for this trip, I wanted to show my children where I spent so many afternoons hiking when I lived up in Estes Park, the city on the edge of RMNP. We camped at a site 1.8 miles in, arriving early Saturday morning to set up camp. We set up our new tent from Kelty and hung the Nite Ize’s GearLine between two trees, where we placed our new Nite Ize Radiant 300 Rechargeable Lantern, a few other items and our headlamps so they’d be easy to find as the sun dropped. The Nite Ize Lantern is extremely bright at 300 lumens, our family preferred the red LED glow when it’s in the light diffuser bag in place of the white LED light around the campsite. When charged, the lantern seemed to stay on forever, it lasted both nights and we had it on as our main light source for both nights. 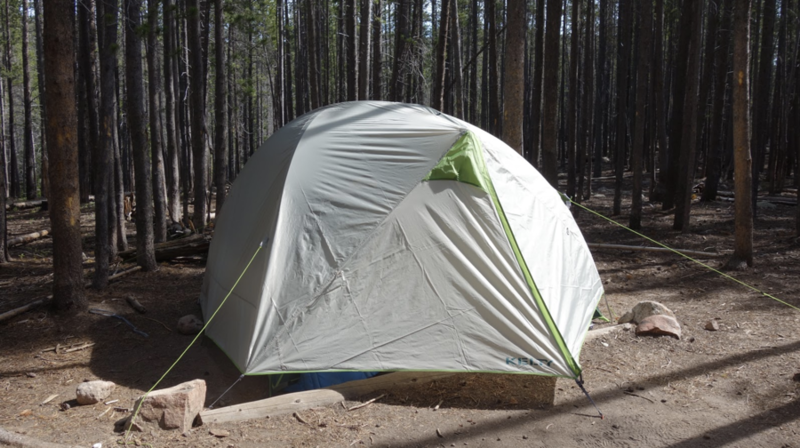 The Kelty Trail Ridge 4 tent was lighter, but a bit larger than the typical 3-4 person tent we’ve traveled with in the past. Usually we’d rent a tent from REI for our yearly camping trip, so we’ve had the opportunity to try many tents. Most of them were too small, so we were very happy to find a tent that easily fit the three of us. Most of all, we were happy to stay dry in the tent, it poured all night, we even broke down and eat snacks in the vestibule instead of eating the dinner we packed. This was one of the wettest nights I’ve camped through, and yet we all stayed dry, our gear, our clothing, bedding – all dry! We soon slipped into our new Kelty sleeping bags, mine was the waterproof Tuck EX-20, they sent us two, they were super warm, absolutely comfortable and unlike other mummy bags I’ve tried, the foot vent gave me some additional room, enough to sleep very comfortably on my side. We slept on our new Klymit Double V two person sleeping pad. My son and I shared it and we were both amazed by how comfortable this full size, easy to pump pad was. The pad had a pretty cool pump attached to it, one anyone could use just by rolling it up instead of blowing into it, you’d have to try it to believe it. Just be sure to close the release valve, otherwise it might take a bit longer than you think, both my son and I made that mistake. There was actually plenty of room for the two of us on the pad, it was very comfortable and now I’m looking forward to sharing it with my girlfriend on future adventures. Kelty also sent us three backpacks. The packs were pretty awesome, extremely comfortable, had a lot of room, pockets and flexibility. The Kelty REVOL 65 has been a great new bag for me. The inside hidden pocket in the top of the bag, the front concealed pockets and a cool waste pocket on each of the sides of the belt, there’s a place for everything in this bag and it’s one of the most comfortable bags I’ve ever hiked with. If I had one complaint, I wish the hidden pocket in the top of the bag was someplace more protected from water as I’d like to keep items in there that might need more protection. My son received the Revol 50 backpack, which was just as cool. The next day we hiked 16.5 miles. We hiked from our campground, to Bear Lake, up to Lake Haiyaha and then over to Mills Lake. I used to live right outside of the park, the year before my ex-wife and I had our son Avi. He’s 18 now, so I had a few special places that I’ve always wanted to share with my children around the park. I worked from my house during that time, so when the day ended, I’d head for the mountains. So many hikes, just as the park was emptying. Although this day the park was kind of full, I personally felt like we were hiking alone, just the three of us, sure people passed by, but this trip meant more to me, hopefully to us, than just a hike in the woods. This past summer was a time that the three us bonded more than we had in a long time and these trails provided the time and a place for us to do just that. Adidas Terrex sent us three pairs of boots which arrived the day before the hike, not their fault at all, so I suggested to my children that we didn’t bring the boots. But then my son said, “so I guess I’m wearing my sneakers,” as he didn’t have boots that fit, so we all packed our new boots and I purchased a box of band aids just in case. Then I put on the boots, they were amazing, they fit all of us like gloves and none of us had blisters. I was blown away, I never thought boots from Adidas were going to deliver, but I was simply wrong. My son, my daughter and I all loved the hiking boots. I received the Terrex Swift R2 Mid GTX Hiking shoe, so amazing, I wear them wherever, whenever I can. They also sent us a few jackets, I wore the Adidas Agravic Alpha Shield Hoodie, while my son wore the Agravic Alpha Shield, both totally amazing, but not waterproof, so I’m not sure they are perfect for an afternoon summer hike in CO, but we all looked good. My daughter got a W Terrex Stockhorn Hoodie, she loves it and feels comfortable wearing it wherever she goes. Surprisingly this outdoor brand was above the rest, Adidas obviously spent a lot of time testing and working on the brand to align with the outdoor lifestyle they are now focused on. Lifeproof was a totally new way to purify our water, I had yet to find a water purifying solution that was so easy to use. They sent us the Lifestraw Universal and the Lifestraw flex. The Universal performed very well, but the Lifestraw flex’s bag began leaking about 8 miles in on our big day hike. However, they were easy to use and no one got sick from the water. The Lifestraw Universal fit right into my daughters water bottle and she has noted how cool that was. I do not think this three day adventure could have been better than it was! Bonding with my children, being in the outdoors for three days, hiking just under 20 miles, it simply does not get better than that in my book. So, if you are into the outdoors, if you are needing some time away with your family, go do something extraordinary, you and your children will never forget the time you skipped town and spent quality time together, the gear was just another cool part of the weekend. Disclosure: Various merchants and vendors sent equipment along for us to review and share in this writeup. Thanks to them all!